My mother, of humble Irish stock, used to say to all of her children: ‘no matter what job you do, do it with a sense of pride’. And that is not a bad dictum to live your life by, is it? If we approach our work/endeavours/art, or whatever, with a sense of ownership, the finished product is all the better for it, and, maybe more importantly, the process, the journey if you like, is infinitely more satisfying and pleasurable. As a young woman, on a massive, four-year work/travelling period abroad, I worked in a shampoo factory in Sydney. Working at the end of the line, and faced with an ever-ending tide of bottles, some leaking, others empty, it was my job to sort them, then pack them, clean, neat, dry, and do it quickly. It became a fantastic challenge, not just to keep up, but also to do the job well. Marcella, at the top of the hierarchy as the bottle filler, gave me hell, shouting as the bottles started to stack up. Occasionally she would nip out from behind the filling machine to check the boxes, in the vain hope she would find a wet and leaking bottle. I admired her even if she was contemptuous of me. She took pride in her job (yes, she was probably under huge pressure too), and took it seriously. I did the same and began to take pride in the aesthetics of the job. A shampoo factory would seem to be the last place where the principles of aesthetics could be applied, but why not? ‘Art’ is all around us. Which brings to mind one of my favourite interviewees, the retired haulier, John Griffiths. I think even John would admit to being a ‘hard nut to crack’ when it comes to interviewing. And, again, I admired that in him: he is a proud man, who has had to work very, very hard to get anywhere in his industry, and make a successful business. This is one man who doesn’t suffer fools gladly. 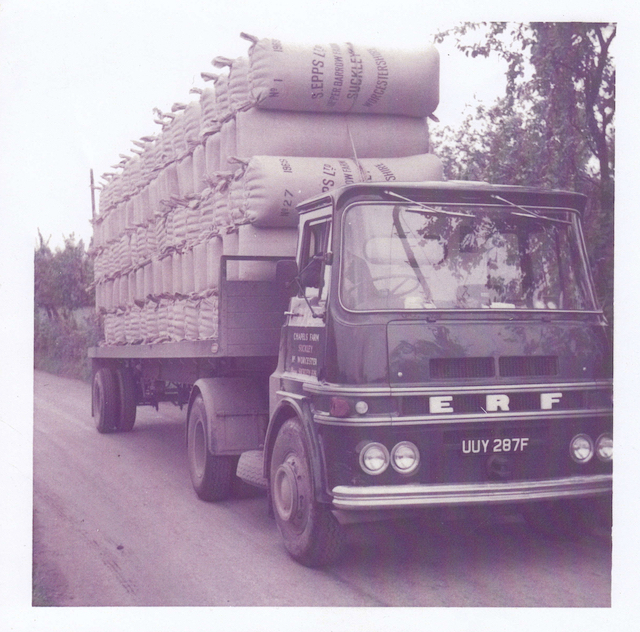 In his day, at the peak of the hop picking hey days, John was one of the main hauliers of hop pockets in the county, with upwards of 50 regular clients. Now, for anyone unfamiliar with a hop pocket, it’s hard to describe how challenging they are to handle. When pressed, they are rock solid, concrete-like, with no give at all. Hauling these around – they weighed around a hundred weight and a half - was work for strong men (no sexism implied here), who used sheer brute force, aided with the all-important hook, an essential tool for the job. But equally important to John was to have ‘an eye’ for the job. Not just for lining them up to balance well, with precision and nicely squared, but also to look, well, beautiful. And isn’t that a touching thing to say? Mum was right: ‘no matter what job you do, do it with a sense of pride’. What a brilliant article! Thank you so much for sharing life as it was before mechanisation.